Photographs of the exterior and construction of the pavilion. 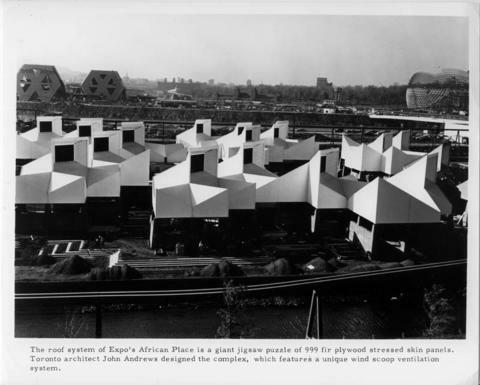 Text on the lower margin of one of the photographs reads "The roof system of Expo's African Place is a giant jigsaw puzzle of 999 fir plywood stressed skin panels. Toronto architect John Andrews designed the complex, which features a unique wind scoop ventilation system." A stamp on verso reads "Plywood Manufacturers of B.C. Photograph". Collins, Piter. "Expo-and After." Canadian architect, 1966 Oct., v. 11, p.69.